Arendelle lucky emblems are a kind of collectible you can look for in Kingdom Hearts 3. They’re silhouettes of Mickey’s head, and you can find eleven of them in the world of Frozen. Since everything is white there, thanks to the copious amounts of snow, they can be tough to spot. If you’re having trouble with them, keep reading our Kingdom Hearts 3 Arendelle lucky emblem locations guide, in which we’ll list all Lucky marks. Spawn at the North Mountains and follow the path north. When you reach what seems like a dead end, run up the wall. Follow the canyon and turn right the first chance you get. Drop down and you’ll end up on the ledge above the valley you’ve already explored. Go left and you’ll find the first emblem on a tree. The second one is in the frozen palace. Follow the corridor until you see a room on the left with a bridge. Climb the bridge using the platforms on the left, and you’ll see the lucky mark on the other side. Once you finish the fight with the ninjas in the large chamber and unlock the second fast travel point, go into the annex in the south and you’ll find the hidden Mickey on the wall. The fourth one is on one of the upper floors. After you’ve used the crystals to climb up the vertical tunnel, you’ll end up in a room with a bridge. When you’re halfway across the bridge, turn left and you’ll see an emblem. After the icicle elevator takes you to the top floor, use the rail on the south to get to a big room with a lot of basalt pillars. Climb onto the hill in the middle of the room, and you’ll see an emblem made of rocks. The sixth one is outside, and you’ll find it on the platform where the fifth fast travel spot is, on the ledge where you first arrive. For the seventh Lucky Emblem, start from the Mountain Ridge fast travel point. Turn right, and go through the small cave entrance. Follow the path into the clearing, and look for a wall you can run up on the right. When you see it, climb it and run along it to the right. Land on the ledge to find the Mickey Head. Interestingly, you’ve already passed #8. Go back to where the cave entrance just mentioned transported you. Retrace your steps, past the pillars with horizontal icicles. At the point where the path turns sharply eastwards, look for the Lucky emblem on the wall. 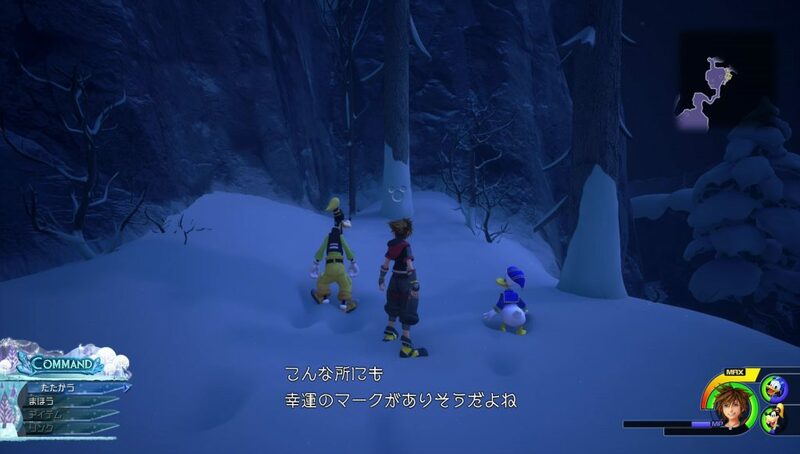 To find the ninth Mickey Head, start from the North Mountain Snowfield save point. Follow the narrow path to the south, and, just before you drop down, look right. You’ll see a tall wall that you can climb on the other side, so do just that. Look behind you and a bit below, and you’ll see the Lucky Emblem on a small snow mound. Now, go down and follow the path on the map into the large clearing. Explore the southwest corner, and you’ll come across a wooden cart with crates, and a mound of logs next to it. Three logs on the mound form the Lucky Emblem. Now for the final, eleventh Lucky Emblem in Arendelle. From #10, described above, and follow the path leading southwest, and cross the red line on the map. In the new area, walk forwards, and go towards the second large rock on your right. Walk around it, and you’ll notice the Mickey Head pretty easily. If you need help with finding Lucky Emblems in other worlds, check out our other guides on Kingdom Hearts 3 collectibles. Among others, we’ve got Monstropolis Lucky Emblem Locations, Caribbean Lucky Emblem Locations, and Toy Box Lucky Emblem Locations. Where is 7-11? Also #5 is in the North West not south, south is the exit.